An Episcopal priest ponders faith, language, and the people we meet along the journey. Each of us has control over our own words and our own actions. We can do and say hurtful things that wound other people. Or… we can do and say kind things that help people heal. As Jesus approached Jericho, a blind man was sitting by the roadside begging. When he heard a crowd going by, he asked what was happening. They told him, “Jesus of Nazareth is passing by.” Then he shouted, “Jesus, Son of David, have mercy on me!” Those who were in front sternly ordered him to be quiet; but he shouted even more loudly, “Son of David, have mercy on me!” Jesus stood still and ordered the man to be brought to him; and when he came near, he asked him, “What do you want me to do for you?” He said, “Lord, let me see again.” Jesus said to him, “Receive your sight; your faith has saved you.” Immediately he regained his sight and followed him, glorifying God; and all the people, when they saw it, praised God. Did you notice that the crowd of people tried to “shush” the blind man? They didn’t want him to talk to Jesus. They didn’t think that the blind man had anything worth saying to Jesus. Maybe they knew that Jesus was an important man and they didn’t want somebody as unimportant as the blind man bothering Jesus. Did you notice that Jesus that thought the blind man was important after all? Jesus stopped walking and took a few minutes to talk to the blind man directly. “What do you want?” Jesus asks the blind man. “Lord, let me see again,” he replies. Immediately, the blind man is healed and is able to see again. This is a story is about a physical healing. Jesus healed the blind man’s physical ailment. However…. there is a second type of healing has taken place in this story. A spiritual healing of the community has taken place. Jesus has allowed to the blind man to return to his rightful place within his community. Back in those days, people who were sick or blind or couldn’t walk weren’t treated very nicely. They weren’t allowed to do everything that other people could do. Sick people couldn’t go to the marketplace or even attend public worship. Blind people often had to beg for money just to survive. Some people even thought that blind people must have done something very bad to deserve their blindness. Being sick or blind meant that you were separated from everyone else. In a way, this separation was a type of wound – a wound that hurts a person’s soul. Did you notice in the story that the blind man, once he was able to see, joined the crowd following Jesus? He became one of them. He was no longer separated from his community. Did you notice that all the people in the crowd who saw the blind man healed praised God? Jesus was healing the spirit of this community. He was letting people see each other, just as he saw them. Now let’s talk about us. What we say to each other and how we treat each other matters. Our words and actions can wound other people. Has anyone here ever had something said to you hurt your feelings? [pause for hands to raise] I think we all have. It really hurts here [touching chest] doesn’t it? It hurts just as much as a real wound. But… how we treat each other and what we say can be healing. Let me give you some examples of both wounding words and healing words. Sienna Brown is a seven-year girl who lives in Birmingham, England. She has a genetic condition called Down Syndrome. Last March, her mother took her to the movies. All of the children in the movie theater were laughing at the movie, but Sienna was a laughing more loudly than the others. A staff member told Sienna that she needed to leave. As they were leaving, the manager told Sienna’s mom that she shouldn’t take her child to the movies. These were wounding words. Milo Castillo is a 5 year old who lives in Houston, Texas. He also has Down Syndrome. Last January, he was at a restaurant with his family. Another family sitting near them made fun of Milo and asked to move to a table further away. The father of this other family made a mean comment: “Special needs kids should be kept in special places.” These were wounding words. However, words and actions can also be healing. Michael Garcia was the waiter in that Texas restaurant. He stuck up for Milo and his family. He asked the family that had made fun of Milo to leave the restaurant. He believed that Milo was important and deserved to be there. He would not allow Milo to be bullied. He let Milo and his family know that they important to him. Michael’s words were healing words. Arianna MacLean is a seven-year-old girl with autism who lives in Utah. Last March, Arianna’s big sister took her to Chili’s restaurant where she ordered a cheeseburger, fries and a chocolate shake. Arianna did not eat her cheeseburger. The cook at Chili’s had cut her burger in half to make sure that it was cooked. “It’s broke,” she told her sister. “I need a new one that’s fixed.” Arianna started crying. Both Brad and Lauren respected Arianna’s feelings. They offered healing words. 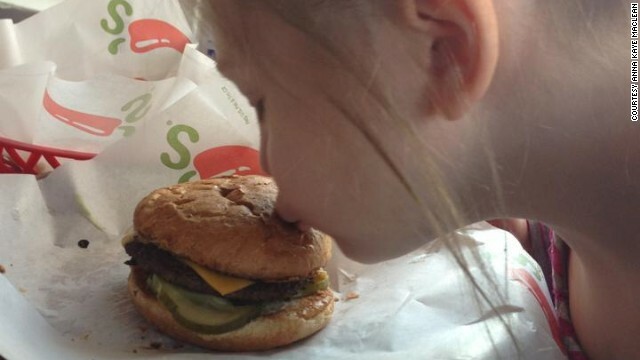 Several minutes later, when the new, “unbroken” cheeseburger arrived, Arianna stared at it for a few moments before exclaiming, “Oh, I missed you!” and kissed the top of the burger bun. Michael and Lauren and Brad were offering healing acts of kindness and healing words to children who had been hurt by unkind words and attitudes. But they were healing more than just these children and their families. Michael and Lauren and Brad were helping to heal communities which view people with disabilities as being less than worthy. How we treat each other and what we say matters. We have the power to either hurt or heal – not just children with disabilities – but everyone around us. Each one of us has a choice. Each of us has control over our own words and our own actions. We can do and say hurtful things that wound other people. Or… we can do and say kind things that help people heal. We can remember how Jesus treated the blind man outside Jericho and choose to treat everyone as important and worthy. musings of a restless heart, finding freedom in the little things.